Just a few days after our “tweet,” the story of this forty-seven year old, unemployed singer from West Lothian in the UK has circulated the globe faster than you can say “I Dreamed a Dream.” A fansite located at http://www.susan-boyle.com has dubbed the phenomenon with the catch phrase “you can’t judge a book by its cover.” It seems no one expected this talented singer to sing as well as well as she has. According to a post on the WSJ dubbed the Susan Boyle Bubble, the video showing her performance of “I Dreamed a Dream” from Les Miserables has been seen well over twelve million times. Susan Boyle’s performance on the show Britain’s Got Talent was an endearing one to watch, because her rendition of I Dreamed a Dream is very inspiring. Not only did she pick “the” right song to audition, but it was sung so beautifully many people have had an emotional reaction to the performance. We hope that this fantastic performance will inspire you to make music a part of your day. If you’re interested in playing or singing Susan Boyle’s audition piece, visit Musicnotes.com for I Dreamed a Dream sheet music from Les Miserables. BREAKING UPDATE: Susan Boyle’s first recording performance was for charity in 1999. Susan sang the blues song Cry Me A River. Here’s a link to the Susan singing Cry Me A River on YouTube! Enjoy! Feel free to chime in with your thoughts on Susan Boyle’s performance of “I Dreamed a Dream” in the comments below! Have a wonderful day! Thank goodness that the world hasn’t lost those beautiful people who just trust in their God given talent. 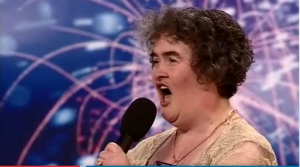 I hope Susan Boyle goes all the way to the finals and wins the goal she so richly deserves. Absolutely like nothing I’ve heard. And I’m a singer (Retired now). For everything there is a season and a purpose to everything under God’s Heaven. Absolutely, beautiful it was heavenly!!! She’s got the music in her soul, simply the great performance in the reality show i’d ever experienced. “Don’t look at her just listen to her.” Its the true songbird !!! A special talent such as this is a gift from God! Her performance is her Witness to God for others to see her sharing of God’s gift from her heart and soul in a way that shows everyone what happens when one doesn’t hide ones talent ‘under a bushel’ , and lets God use then as an instrument to let others feel the love of God through their sharing! Praise God!!! Susan Boyle has deffinately got the voice of an angel and i hope that she goes all the way to the final and wins what i see is rightfully hers. I would love for Susan to produce an album of songs as i would be one of the first to buy and listen. Wouldnt it be something for susan to perform with the backing of the royal philmonic orchesta.I can only say with fingers crossed, watch this space. I give a big thankyou to Susan for shareing her beautifull talent with us all. My goodness, Susan is so pure and her voice is awesome. Her style is so wholesome. I love to watch her video over and over and over. She is just precious.. I hope and pray she is able to do great things with her God given talent. Susan for me you are a winer,the best voice is so awesome i watch you video over over again,you make me so happy i love you DVL. I pray for susan boyle. Susan is impeccable! I dreamed she would be my mother! I want to cry to you every inch of that grief(emotionally! ), coz. there’s hardly anyone by my side who knows the intensity of your song!Let you be immortal,oh tears!they can’t help but flow! Your singing of “I Dreamed a Dream caused emotion to well up in me to the point that I had to swallow to keep the tears back. Your voice is one that resonance to the soul and inspires one to want to achieve . God Bless and may you sing forever.